At this time, SymmetryMill 2 is available in a beta version from the Download SymmetryMill page. *) You don’t need a paid subscription to give it a try. The rules are exactly the same as before. 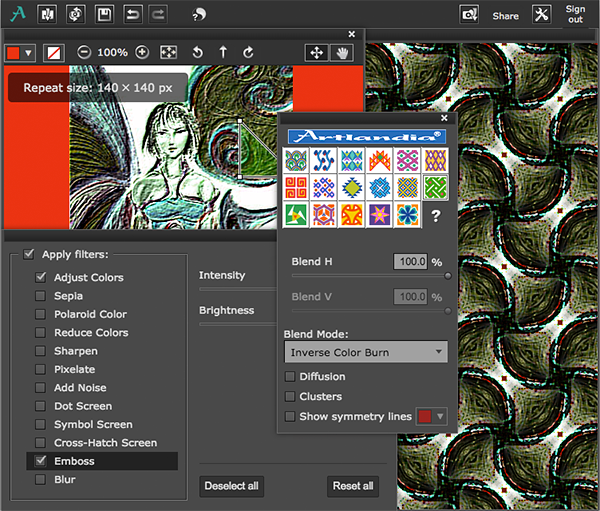 As a paid subscriber, you will be able to make patterns from your own source images. With the free Limited version, you can use the built-in “demo” image—and the new features will give you even more mileage within the free version! We will introduce the new features in due course, but for the moment, we want to make certain that your transition to SymmetryMill 2 is a smooth one. To this end, we’ve invested a great deal in making sure that the new, cutting-edge technology, which opens up many exciting opportunities, still reproduces your previously saved patterns as faithfully to the original as possible. SymmetryMill 2 faithfully reproduces legacy SymmetryMill 1 patterns. That’s where some help from existing SymmetryMill users will be most appreciated. Please import your old patterns into SymmetryMill 2 and see if you get the same results. If there is a problem, do alert us at your earliest convenience! 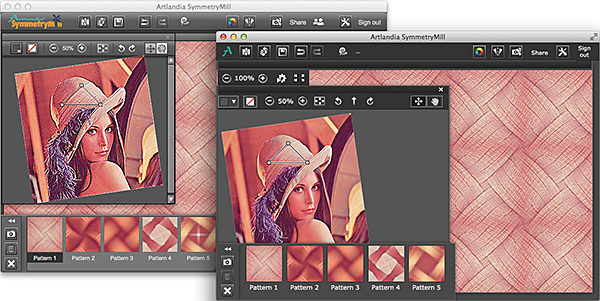 Importing your old patterns into SymmetryMill 2 should be safe and can be done as many times as you want. 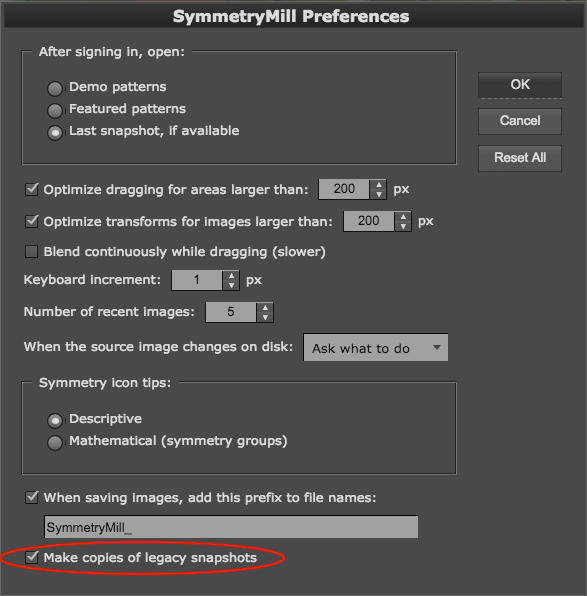 There’s a special checkbox in the Preferences dialog, “Make copies of legacy snapshots.” That checkbox is selected by default and, as long as you leave it selected, your imported patterns will appear in separate sets, keeping your old SymmetryMill 1.x snapshots intact. Leave the “legacy” checkbox selected for the time being. The newly imported sets will be marked [Converted]. You can work with them in the new SymmetryMill and open your old snapshots in the legacy SymmetryMill, just as you did before. Once you are satisfied that your old patterns are imported properly, you can delete the old pattern and march bravely into the new world. But don’t do that just yet: wait until SymmetryMill officially graduates from the beta program and becomes a released app! In the meantime, please stay tuned for more details about SymmetryMill 2 and do let us know how you like the new app. Please leave comments or email us directly. Thanks for your help!